Poetry doesn't always have to be serious or difficult to understand, as funny haiku poems will show you. Children can be introduced to this form of poetry and begin to write their own funny haikus. Whichever one you're familiar with, forms of haikus are very brief, which is perfect for the short attention span many children have. Although formal types of haiku may adhere closely to the original Japanese format, people have adapted haikus to talk about many different subjects, not just seasons. Funny haiku poems can cover any topic. When writing them for children, think about what makes them laugh, and then write about it! You don't have to be a poet to enjoy haiku. Younger children will probably find haiku very enjoyable as these poems are so short. These online resources provide a wide variety of funny haiku poetry and other forms of funny poetry that cover a wide range of topics. 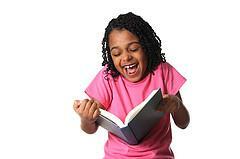 Giggle Poetry contains a large selection of poems designed to bring a smile to a child's face. All of the haiku doesn't stick to a traditional format; it's more important that it be funny and appealing to kids. Haiku Poems and Poetry for Kids is a blog dedicated to haiku that children will enjoy. Most of the haiku here is humorous and suitable for children of all ages. The PBS site not only offers a poetry section for children featuring characters from some of their favorite TV shows, it gives a brief explanation about haiku and helps to inspire kids to write their own. Funny Poems will appeal to those in the age 7 to 11 bracket, and lets parents and children know that some of the poems cover topics that are more appropriate to older children. Placing "haiku" in the search box will point you to a funny poem. Once a child learns about haiku, he may be inspired to pick up a pencil and create his own. Because these are such short poems, kids can get a great sense of accomplishment in a short period of time. Parents can help encourage this creativity by taking an interest in a child's poems, but keep feedback positive so that he wants to continue writing. Where is my dog Spot? I say why not vote? Don't be surprised if a child doesn't want to stop writing haikus once she starts. Parents may want to keep an eye out for contests promoted in children's magazines or through the school, as a way to encourage this writing outlet further. By the time kids get to junior high and high school, their love of poetry will be expanded to many other forms, but they may always have a special fondness for the funny haikus they discover today.